Looking for a creative way to wrap a baby shower gift?? 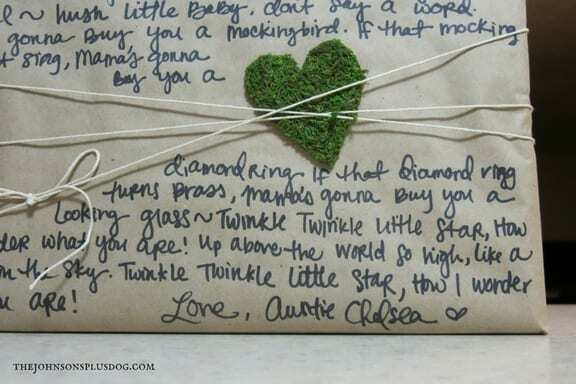 This DIY lullaby baby shower gift wrap couldn’t be easier. 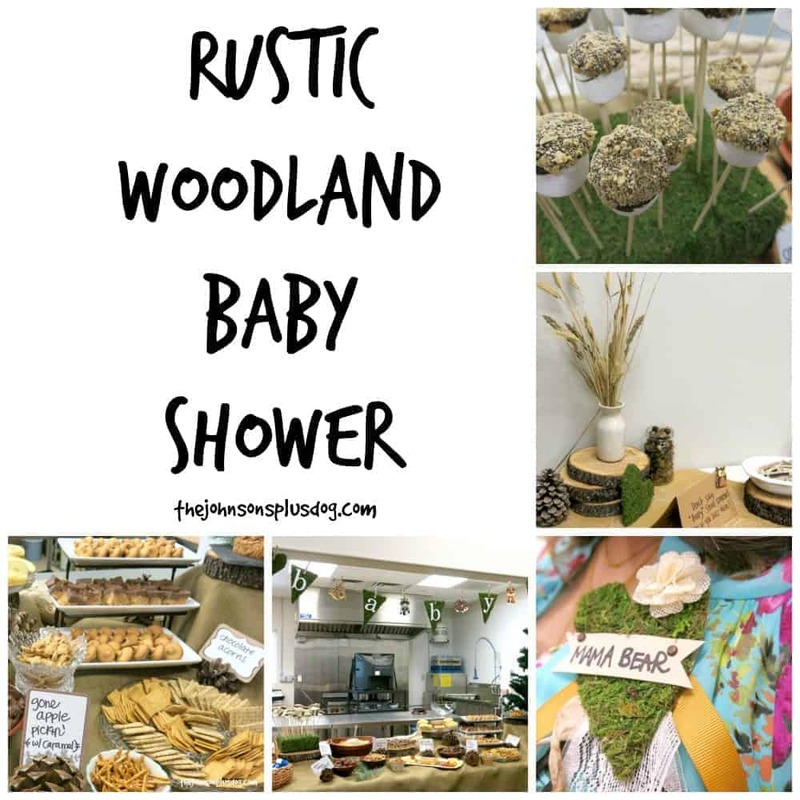 When I was planning my sister’s rustic woodland baby shower, I knew I wanted to wrap my present in a way that both matched the baby shower theme and was also creative and easy since I was wrapping everything up at the last minute when I was packing things up to take to the shower. Kraft paper is, of course, a favorite of mine. I love wrapping my Christmas presents in it and then getting creative with different bows and lettering on the packages. It is so versatile that you pretty much always need some around. 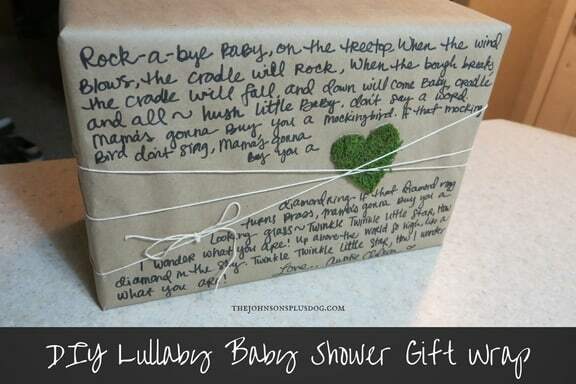 I love how my lullaby baby shower gift wrap turned out! 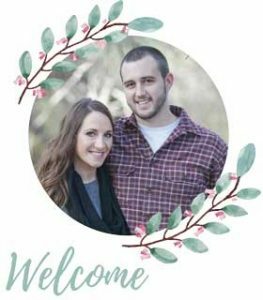 It’s so simple and can be varied with different quotes or songs for more than just baby shower gifts. 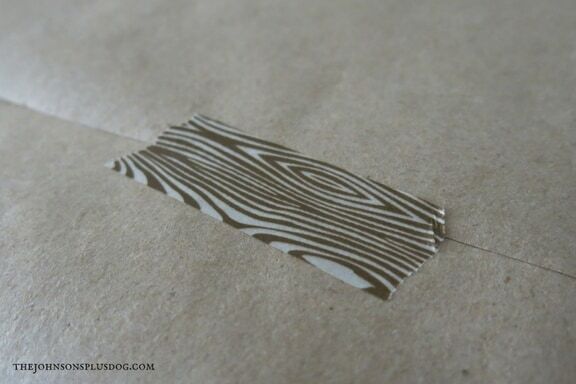 Washi tape (or regular tape) – I got my wood grain washi tape shown here from Hobby Lobby, but they don’t sell it anymore. Here’s something similar. 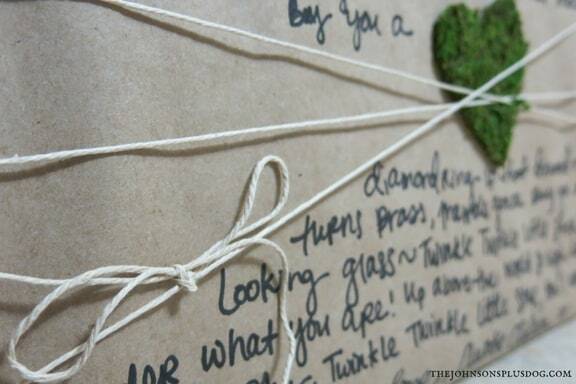 First, you will wrap the present in your kraft wrapping paper and use decorative washi tape to attach. Next I wrapped the twine around the package multiple times and varied the string at random angles. I finished by tying a bow with the two ends on the front of the package. 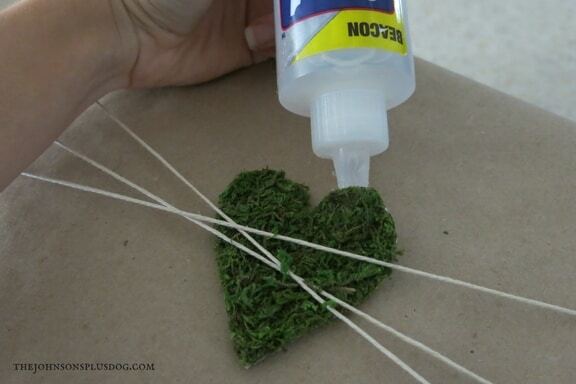 I cut a small heart out of sheet moss and glued to the paper under the twine. Step 3. Write baby lullabies. Lastly, I finished by writing sweet baby lullabies on the front of the baby shower gift in black sharpie pen. I wrote out “Rock-a-bye-baby”, “Hush Little Baby” and “Twinkle, Twinkle Little Star”. I just love how the baby shower gift wrap turned out and it seriously took me maybe 10 minutes to throw together. The best part? It was FREE! I had all the supplies already on hand. Also, I didn’t have to buy (or make) a card because I signed the outside of the package. 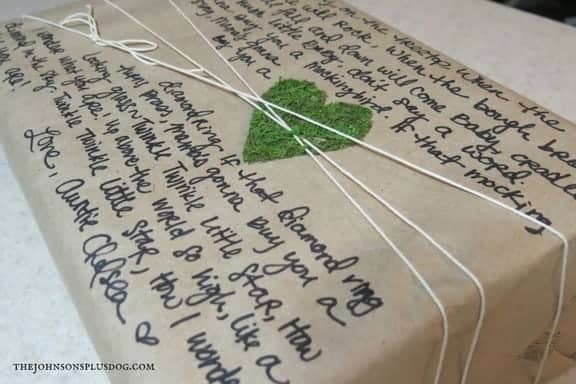 Do you have any other creative gift wrap ideas? Let’s see them! Check out my Pinterest gift wrapping board for more great ideas.